I loved spending time in Livingstone for the simple reason that there was just so much for me to do as a tourist. After coming through Central Africa which was far from tourist-friendly, everything in Livingstone is set up with tourists in mind. However, after almost three weeks in Livingstone, I still hadn’t even visited Victoria Falls, the top attraction. After seeing the falls from a helicopter the week before, I decided to leave my big DSLR camera at home and pack my GoPro with me instead and go right into the heart of Victoria Falls. Since I was there in the rainy season, Victoria Falls is spewing so much water it is an absolute shower along some of the trails, in particular across the bridge. 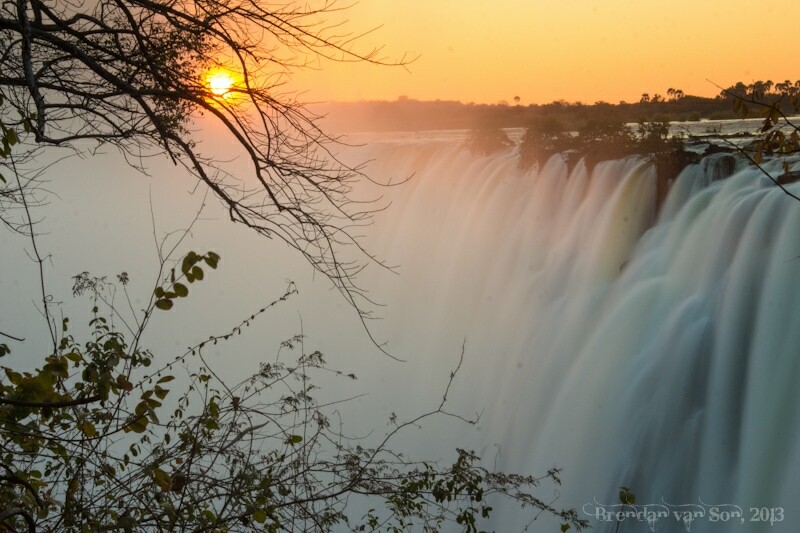 Running through Victoria Falls is like running through a hurricane, and with the occasional wind manipulation of the water, you can have the water hitting you from the falls from any direction, sometimes even from below. All-in-all, this day of running through Victoria Falls was one of the best afternoon’s I’ve had in travel in a very long time. I felt like a kid racing through a giant sprinkler. It’s highly recommended. Next episode, I take to the waters of the Zambezi River on a jet boat. Stay tuned for that! Your videos always make my day and make my feet want to jump on the next plane somewhere magic. Thank you for continuing to post them. What’s a little water anyway, you’ll dry out. Great video. Looks like fun! What a gorgeous place. I did the same thing in 2010 when I was at Vic Falls. Going without the rain coats is the best!